Good morning sweet friends! How does Friday get here so soon, lol? I’ve shared this card on the Spellbinders Blog but wanted to show it here today so that I could offer it for Day of Giving Friday. When I showed it before I offered step by step directions on how to put it together and you can see those instructions HERE. To cut the frame into four neat mitered pieces as I have above, I’m using Spellbinders 6×6 Graceful Frame Maker – you can see a video on how this die does it magic HERE. 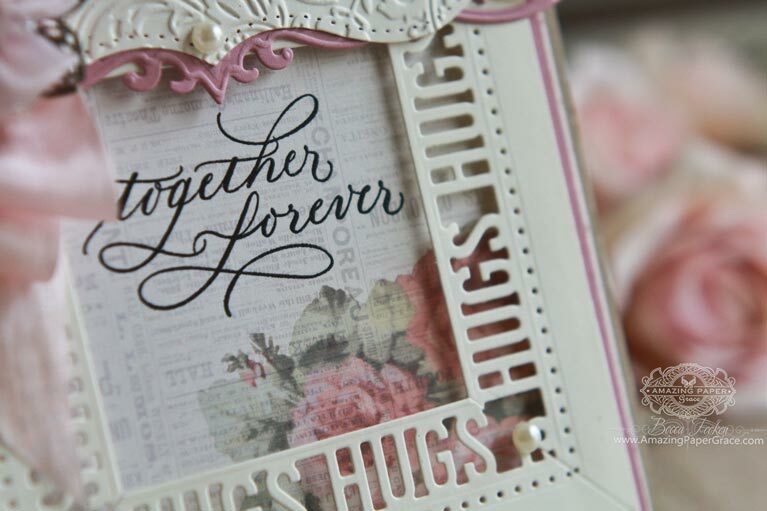 The focal die that I’m using for the card is Spellbinders Sweet Words and from that set I’m using the Hugs Border. At the top of the card I’ve used Spellbinders Art Deco – Deco Duality cut using Spellbinders A2 Bracket Border. 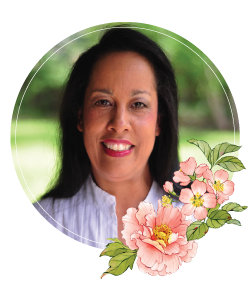 I used my favorite embossing folder – Spellbinders Floral Embossing Folder – I think it adds just that special touch of texture to the top of the card. Just as a note of follow up, I went to my friends funeral last weekend – she was a fellow crafter and we’ve been in the same small crafting group that has met every month for approaching 18 years. It was a sweet celebration of her going home but her illness was pretty short and the swiftness in which it all happened caught so many of us off guard. I say that because she has been on my mind this week, and her circumstances have had me deep in reflection. That’s how it happens, isn’t it? We get so busy with things – some that are important and some that are not. Yes, there is sadness, but yet she leaves me with a sweet gift to do some course correction and fine tuning to make sure life is as full as it can be. I thank her for that reminder. For new readers, every Friday it’s my pleasure to give away a card. The card goes to a randomly picked reader (worldwide) who leaves a comment in our conversation. Want to know more about Day of Giving, here’s a link to my FAQ’s just check out #11. You can check the list of winners HERE! For your comment: Kindness can be as simple as a smile, a hug, lending a shoulder or sending a card. What is your favorite way to share your kindness? As always, I thank you for taking time to stop by – I really appreciate it!! Beautiful card, Becca. I have the frame maker die and am eager to use it. Hope you are doing well and please keep posting! Is there no end to your creativity? Emboss a plain boarder. That is SO cool. I like the hugs frame! And I’m so sorry to hear about your friend, Becca. My condolences to you, he family and friends. I like to listen and share a hug. So easy to do, and it means so much. Hi Becca…sending SMILES and HUGS your way to thank you for your inspiration and kindness shown to me! You are a TREASURE!!!!! Your card is lovely as always they are…thank you for sharing with us! I love to SMILE at people as I am on my way somewhere…such a delight to see them SMILE back, even tho’ we do not know each other. A SMILE is such an easy thing to give and always helps to brighten the day! This is one ? (HaHa)favs and I have been tuned in for about 8-9 years. When I think of you, I think Hugs so this cards says it all about you! Always ending your blog with hugs, made me start doing the same. I think sending a card shows my act of kindness as everyone of my friends know that I make all my cards. Therefore when a fellow worker’s Mom died, even though we had a little falling out, I still sent him a card as I knew how much his mother meant to him. I later stumbled upon him and he hugged me and said, You don’t know how much that card made to me. I will never throw it away.” I was truly honored for him to tell me that. What a lovely sentiment on this beautiful card of yours. I’m loving my frame maker mad often loose a couple of hours trying out the different borders that Spellbinders have created over the years. What a beautiful card! I never tire seeing your craft and how you inspire me to “think outside the box”. Thank you for focusing on kindness, we can never have too much in this world. I use all the expressions you listed but my favorite is offering my prayers-especially, when things appear hopeless. Beautiful card!! I enjoy spreading kindness with a smile for everyone or by lending an ear to anyone who needs it. I enjoy spreading kindness :-). Thanks for sharing your creative cards! Hi Becca, A really beautiful card, at first glance I thought it looked like a window frame with a ‘pelmet’ (valance) at the top of the window. I love to smile at everyone and I will do anything I can to offer help to anyone, kindness helps everyone and costs nothing. Fabulous card Becca! Always love your bows the best. I find that the best act of kindness I can give a person is time. I love all your cards. I have all your new dies on my list to buy in the next few months. It’s far nicer to be kinder and offer a smile even if it’s the only thing you have to give. Good morning Becca, Beautiful card!!! I like to say Good morning and pass the time of day, smile as you pass by it works wonders. A beautiful card Becca – and a bitter sweet week for you. Hugs. As I am mainly housebound (or at a hospital appt) these days with DH being so ill, I try to send cards when I can to others in the extended family who are also unwell. I also comment as much as I can on others blogs to encourage them in their crafting. Of course there is always prayer in the mix!! Wow… this one is a beauty! Love the textures and details! Giving my time is how I like to show kindness. 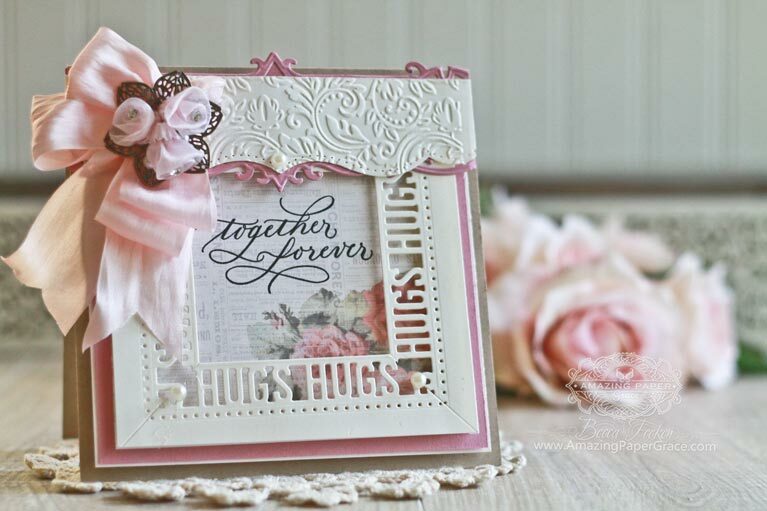 I loved this card on Spellbinders blog and love it herre. I appreciate seeing how you used this particular die in your collection. It’s pink too, so perfect! I like to send a card I’ve made and include a short poem I’ve written on the inside. I always hop we that it brings a bit of sunshine into the recipients life. pretty card! Our friend had been sick alot longer than anyone knew except me. She and I talked every weekend until the summer. I will and do miss her deeply. As an act of kindness I call and check up on people, give hugs or words of encouragement whatever seems to be the right gesture for the moment. Your Card is like a hug made to my heart. Thanks ! I like giving hugs but it´s not so appreciated at home. So that I lost its savour, even if I feel an abyssal lack of receiving. Love this card, only thing I couldn’t find was the design paper you mentioned with that beautiful rose on it. That really helped to balance the whole thing as well as add the subtle color. Hi Becca! What a lovely card as always! I’m so sorry for the loss of your friend and for the speed of her illness which took so many by surprise. I’m sending love and hugs as I’m a bit of a hugger!